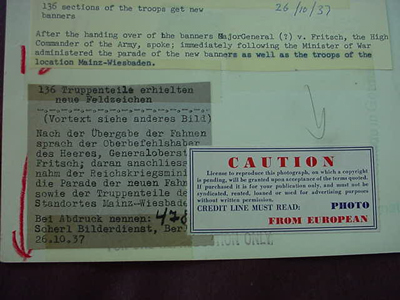 Recently Germania International was very fortunate in being able to purchase a very large collection of absolutely original Press Releases from the European Picture Service. This was the official liaison between the U.S. and actual European Press Agencies. 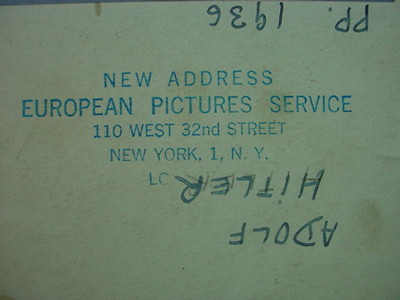 The European Press Service was located at 353 5th Ave, N.Y., NY and later at 110 West 32 Street N.Y. No other could be more official or more genuine. 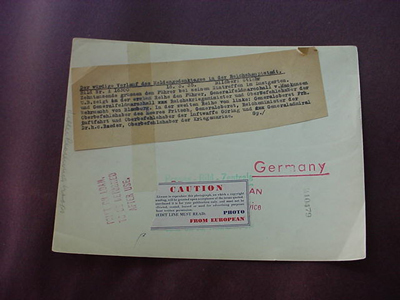 If it happened in Europe to include 3rd Reich Germany, it would be photographed and immediately sent to this company that was in essence the only picture service that can be called official. 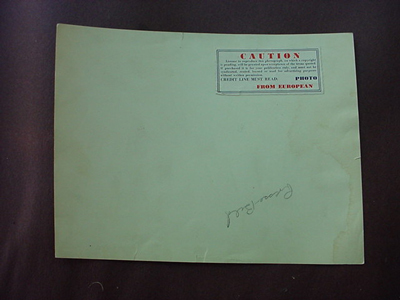 Generally the pictures have a caveat that can be seen on most of the pictures that says CAUTION and to notify the newspaper using the particular picture that all copyright privileges are non-waived and that pictures will be released and usage granted upon acceptance of the terms quoted. When the picture is purchased it is for that journal's publication only and must not be syndicated, rented, loaned or used for advertising purpose without written permission. 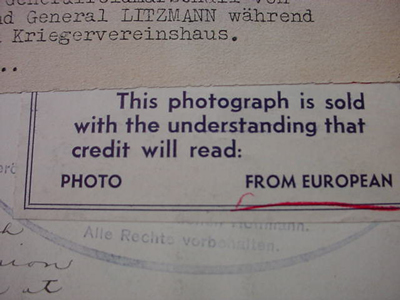 And most importantly, it is pointed out in big letters – Credit Line Must Read Photo from European. 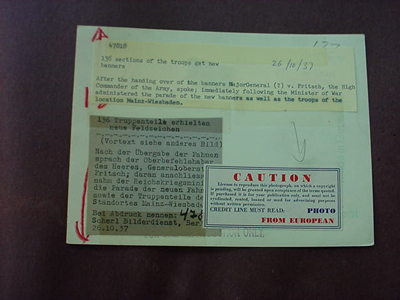 Many of the pictures have the explanation of what you are seeing printed in German and sometimes the reporter makes penciled notes about the way it will be translated and what the by-line will be. Please keep in mind that several photos would often be sent of the same subject and the ones that were considered most clear and photographically fine were chosen. The group we offer are all the best that were chosen. In some cases we have the original press release and the clipping from a newspaper of that picture as it appeared in the newspaper (this is truly rare!). The pictures are mostly ones that probably appeared in daily journals but never have been included in books. In other words, unique in a way and certainly very rare and historically important. When you own one of these, you in all probability own the one and only edition of it and can be practically assured that it does not exist elsewhere. Under the ill-advised and dubious de-Nazification process at the end of the war and the beginning of the Occupation, most newspaper offices in Germany were sacked and all their WW II photography destroyed so in most cases the only originals were found in the U.S. 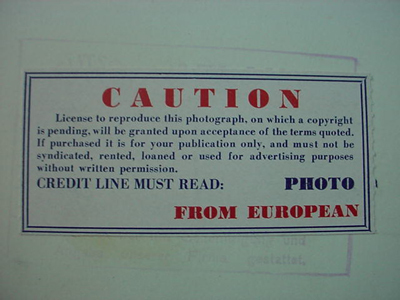 The other warning that can be found on the form of a stamp on many of the pictures state “Photo from European is the expected credit line." This photograph is not sold but a license is granted for its publication as a news photograph only it must not be loaned, sold, copied or shown on television without our consent. Quoted price is for one reproduction only. 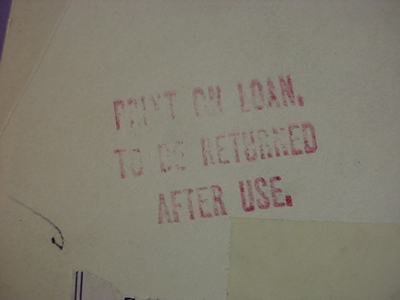 File prints must be returned after use. The restrictions were clear but years later they were still in effect and you notice that even television companies couldn’t make use of them without permission. Then years later a large group of them were procured by a picker who works with us from time to time and brought them to us and they obviously were released. We are going to offer them a few at a time to the collecting public and journalists of today. Remember the absolute uniqueness of these archival gems! To own one is to own an actual record of history. One picture is worth a thousand words and to have an original, that is incredible! 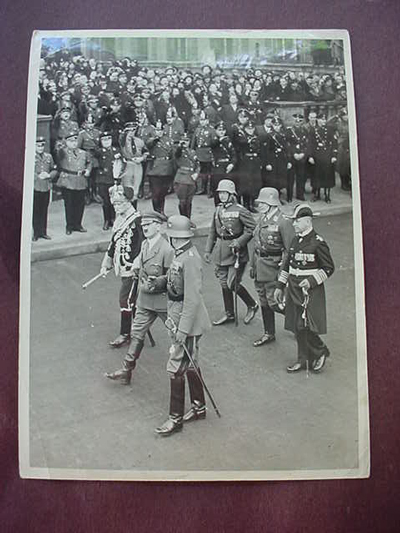 DESCRIPTION: Here is a brilliant picture that measures 9 ½ x 7 of the German leaders leading a parade that follows on the occasion of the Heldengedenktages I Der Reichshauptstadt (Hero Recognition) celebration in Berlin 6/3/35. 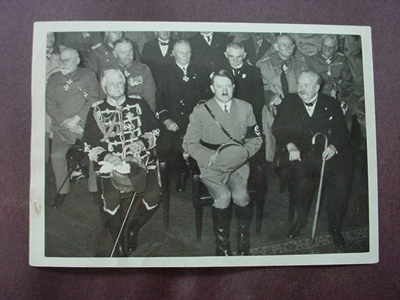 You can see here the old Field Marshal Von Mackensen, and the supreme Commander of the German Army Von Blomberg with Hitler in the middle. Behind in the second row is Generaloberst V. Fritsch and the supreme Commander of the German Luftwaffe Herman Goring and General Admiral Raeder Commander of the German Naval Forces. The photo is dramatically great! And the spectators who are seen at this point are high political leaders and police officials and a contingent of SS officers. 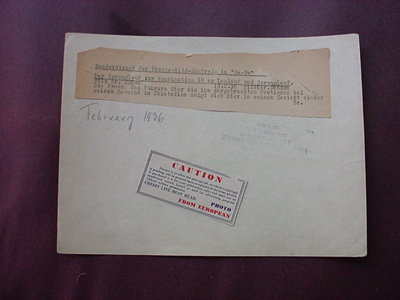 This is an official one of a kind original press release marked in large red letters on the back (Germany), along with the explanation of the picture that is adhered to the paper on the back. 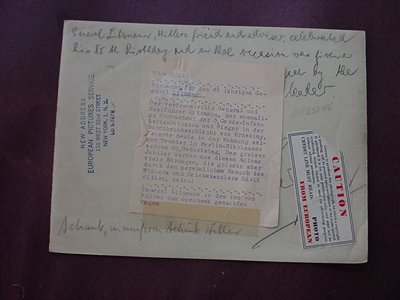 This was directly from the Presse-Bild Zentrale (Press Picture Control Office) in Berlin and it is stated that it is on loan and must be returned after use. 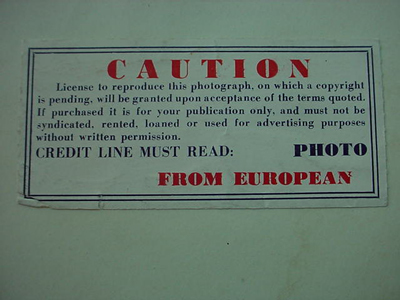 It is serial numbered and has the caveat of the European news office in N.Y. under the word ‘caution.’ Don’t sell it short; it is a prodigiously important photo archive picture and 100% original. DESCRIPTION: Here is a 100% original and official press release from European Press Service located in New York City. This one does not have the usual slip in German that identifies what is happening in the picture. But it is a sharp brilliant photograph of the German military leaders as they arrive for the Reichsparteitag (Annual Party Congress) in Nuremberg. 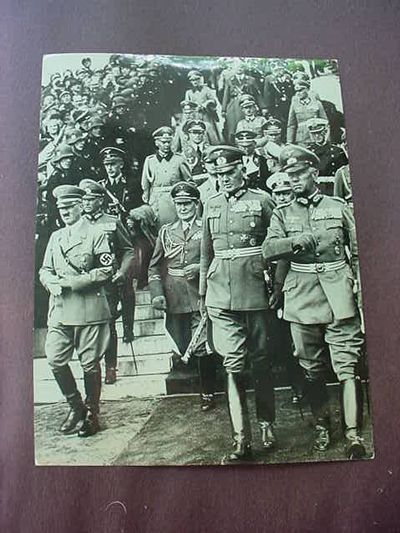 Leading to the right of Hitler is Chief of Army Staff Werner von Blomberg and to his right is an unidentified General and to the left, middle Luftwaffe marshal Hermann Goring and directly behind Adolf Hitler is General V. Fritsch and then an array of officers of the Army, Navy, and SS. 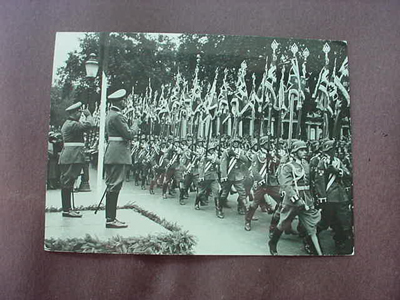 Along the side ranks are troopers of the SS Leibstandarte body guard and behind them are cheering masses of people. Some of the officers are in the second row. Following also are adjutants to the top leaders -- you can tell this by their aiguillettes on their uniforms. Please remember when you purchase this photograph, it is absolute unique and probably was published in an American newspaper at some time before the war. You and you alone will own the original and become the custodian of a very important archival treasure quite suitable for framing. The absolute Best in historic original photography! DESCRIPTION: This is one of the most important of all the press releases that we obtained in the group. 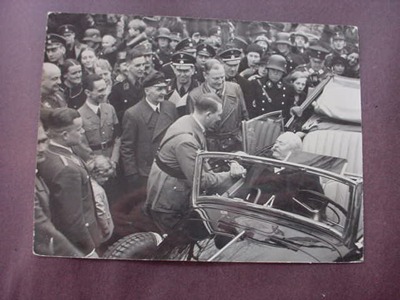 It is the historic meeting between the old Field Marshal von Hindenburg and Adolf Hitler after Hitler was appointed Chancellor; this historic meeting and subsequent ceremonies occurred on Feb 24th through the 25th, 1934. This was a commemorative event of the unveiling of a solemn memorial to the fallen of WWI (in other words, Memorial Day). 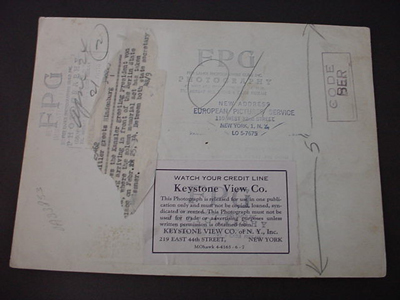 The back of the picture is replete with official press stamps to include the European Press Service in N.Y. and the Keystone View Co. and also Free Lance Photographs guild in N.Y. These are the press companies that received the loan of the picture on April 24th so you can see that several companies did rent or borrow this particular photo from the photographers in Berlin, the original photographers whose stamp is also visible. This is the best by far. Remember when you purchase this photo you have bought the original picture of this historic event. It may have been printed in any number of papers at the time but in newsprint. This on the other hand is the glossy original. We repeat original! 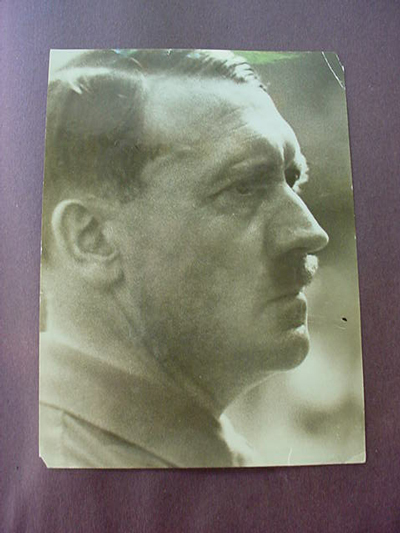 DESCRIPTION: This is an excellent photo that had to be from the Heinrich Hoffmann studio -- he was the only photographer who could take such a close up of the Fuhrer. 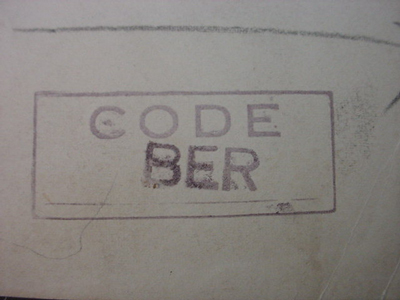 It is measured at 6 ½ x 9 and is in a semi-sepia tone. It has a small part folded at the top right and its very top corner is missing .Other than that it’s in fine condition. 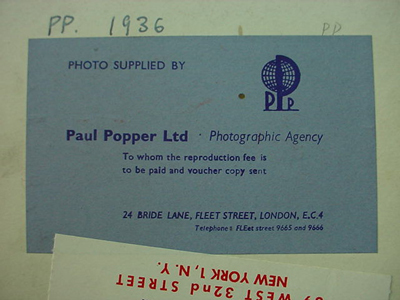 This photo first went to London, England in 1936 to the Paul Pepper Ltd. 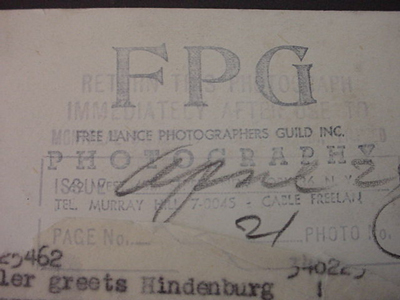 Photographic Agency. It has their label on the back. 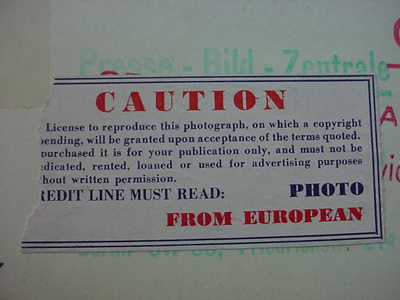 It then was bought by the European pictures service in N.Y. and has their stamp and their instructions label that advises other journalists and editors that the picture is the property of European and there is a caveat there that meant business. This is a true to life photo of the man who rose from obscurity to the most powerful political leader in the world. The pensive look of inner nobility is unmistakable. It is not the face of a monster; it is a photographic study of a man whose every thought was for his Germany. Go ahead throw stones at me but this is my opinion. War criminal? It depends on your perspective. I think of Roosevelt, Churchill and Stalin as war criminals for their deeds. (Again perspective!) In any case, this may be the best likeness of the man Adolf Hitler that I have ever seen. And it has never been published in any book that I know of. When you purchase this photo you are the owner of a prodigiously important photo archive piece. DESCRIPTION: This is a beautiful, very dramatic picture and an official news release showing the march of the flag bearers of Das Heers (German Army) parading in Mainz, Wiesbaden before Major General Von Fritsch, who at that time was the Chief of the Army General Staff after he spoke. 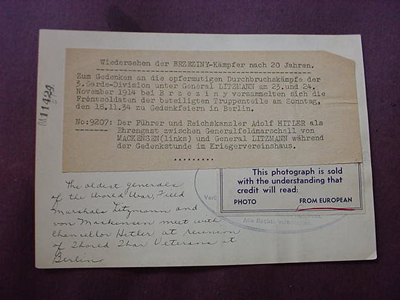 The picture measures 7 x 5 ¼ inches and on its back is the explanation provided by the German picture Service “Scherl Bilderdienst”, Berlin. 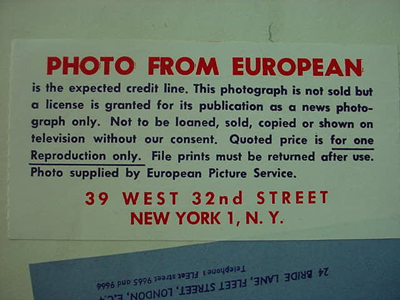 Then there is the translation in English and the caution caveat by European picture service in N.Y. This is a great picture from the days of Germany’s great (pomp and glory!). 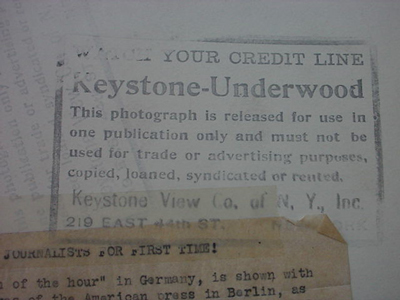 Remember it is the original photo that may or may not have been published in American newspapers of the thirties but rest assured, published or not, you upon purchase will have the original important archival relic. 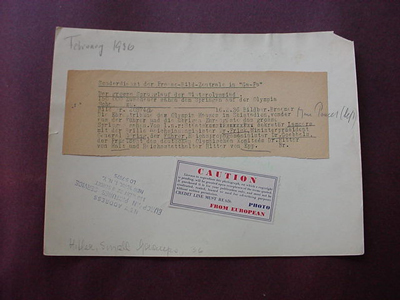 DESCRIPTION: This is an original press release from the European Press Service in N.Y. and it has the caveat on the back that states that the photograph is sold with the understanding that the credit will read: Photo from European. It also has a glued on explanation in German from the official German News Bureau explaining what is seen in the picture. It basically says the Fuhrer is an honored guest for a ceremonial celebration of Veterans of WW I and earlier in Berlin. 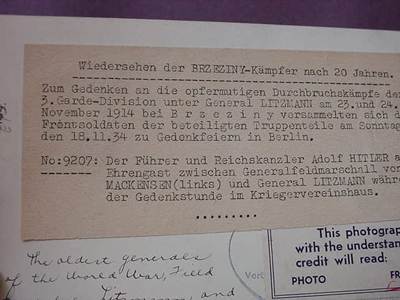 This day was one of two for the Veterans of the three Garde-Divisions under General Litzmann who in November 1904 was very instrumental in winning the battles of Brzeziny and Lodz and later when the Wehrmacht occupied Lotz in the 1940’s they renamed it Litzmannstadt. Following the hostilities, Litzmann became an active NSDAP member fully supporting Hitler and becoming Allarsprasident (by seniority) of the Reichstag from 1932 to 1936. He died May 28th, 1936 at age 86. He won many awards in WWI including the Pour Le Merite on 29 November 1919. 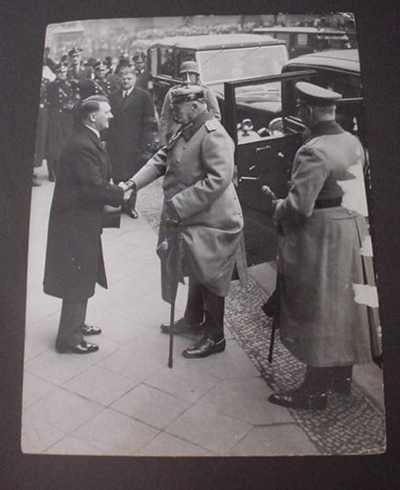 The picture shows him with Fuhrer and Field Marshal August von Mackensen, one of the Reich’s most prominent military leaders; Mackensen had a brilliant career in the Kaisers army with many victories to his credit along with his Death’s Head Hussars. After the war he first supported President Paul V. Hindenburg but after Hitler’s ascension to he became a visible if only symbolic supporter of the NSDAP and was often seen by Hitler’s side attired in his resplendent black Hussar uniform of the Leibhussaren. The picture is entitled the Last Reunion of the Brzeziny fighters after 20 years of reunions, and Litzmann and Mackensen are referred to as the oldest generals of the World War still alive and active. 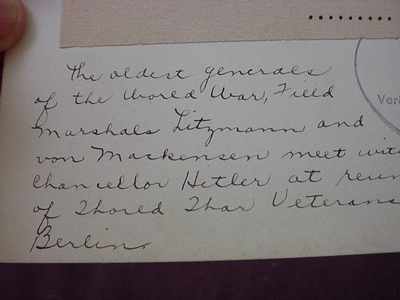 Behind Hitler and the two old warriors are more elderly ex-soldiers of the Kaiserreich. 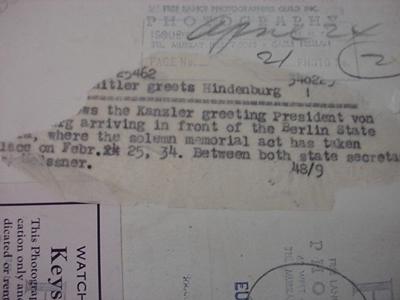 This is a great historical archival photo and again when you purchase this photo you can be assured that you are buying a unique item that may have been published back in the thirties in some newspaper on newspaper stock but here is the original glossy original press release. Again absolutely original. 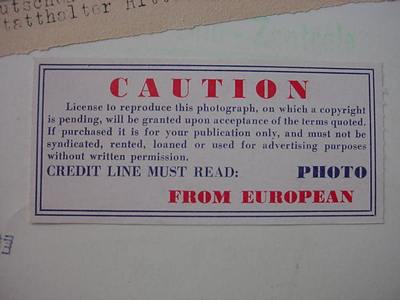 On the back it has the German explanation from the German Press Corps with the caution label from the European picture service in N.Y. Is with a caveat that reminds any newspaper company that the credit line that must be published should read (Photo from European). 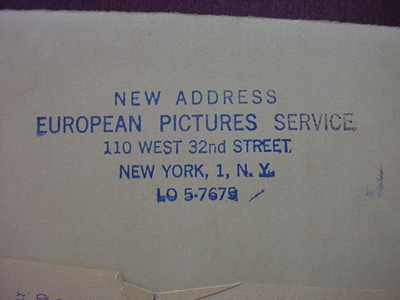 There is a stamp also that reads the new address of the European Picture Service. 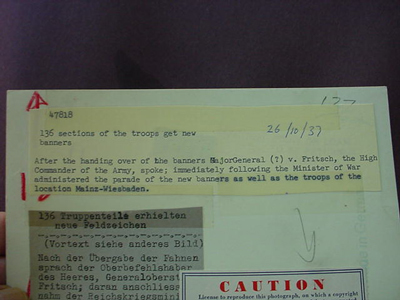 There are penciled notes translating the German attachment to English. Again we feel we should remind you that when you purchase this photograph you are buying the actual one of a kind press release and it is not published in any book. It may have been published back in the 30’s one time only in a new story but on newspaper print. This however is the glossy original! 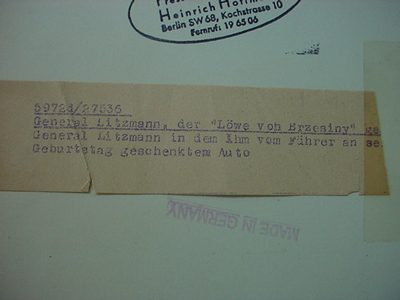 DESCRIPTION: General Litzmann was referred to as the Lion of Brzesiny. For more about him see the photo at No. 6 above. 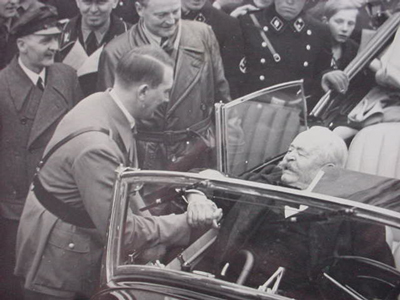 Adolf Hitler is seen affectionately grasping the hand of the elderly General as he sits in the seat of the automobile that the Fuhrer gave him for his 85th birthday. 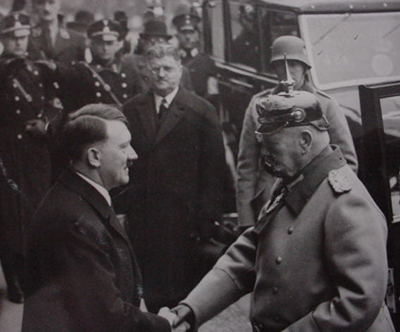 He deeply admired the old German warrior and this is reflected in the look of deep devotion and respect on the face of the Fuhrer. 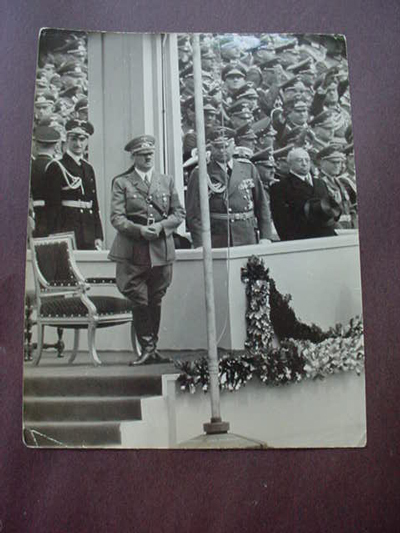 Behind Hitler are various political leaders and military officers to include the Gauleiter of Berlin and propaganda Minister Dr. Josef Goebbels. The absolutely brilliant glossy black and white photo measures 7 x 9 ½ inches and was submitted to the German news agency by Heinrich Hoffman, the Fuhrers personal photographer -- it has a stamp that says in English made in Germany and of course the caveat of the European picture service plus a small tab that explains in German what you see here. 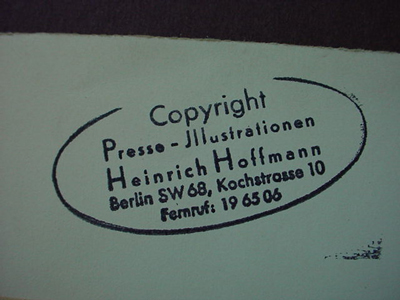 And then most importantly the copyright stamp of Pressed Illustration by Heinrich Hoffman Berlin SW 68 Kochstrasse 10 (with phone no.). The potential buyer is reminded that when he buys this original press release, he is buying an original. It may or may not have been published in some newspaper in the U.S. but on newspaper stock. This however is the original one of a kind glossy photo. No other of it exists. Exclusively yours! DESCRIPTION: This is fantastic! 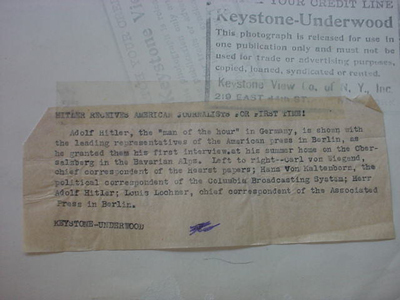 The original press release shows The ‘Man of the Hour’ Adolf Hitler with the leading representatives of the American Press in Berlin as he granted his first interview at his mountain retreat at Obersalzberg. 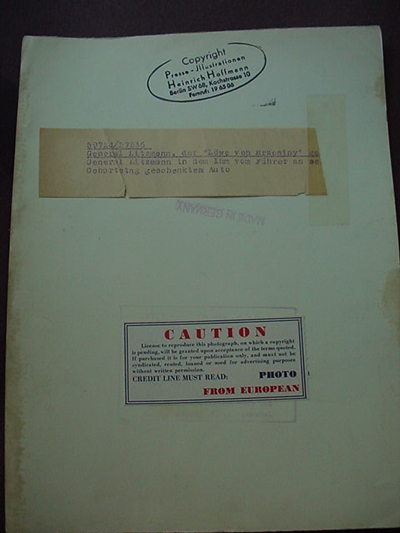 The names of the correspondents are well known to history and there is a tag glued to the back of the photo that explains everything in English. 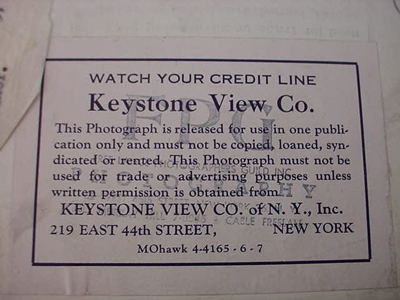 The picture was taken for the Keystone-Underwood Press Co. and their caveat is seen in a double stamp on the back. The picture measures 10 x 8 inches and is in good condition except for some minor fraying at the outer edges. 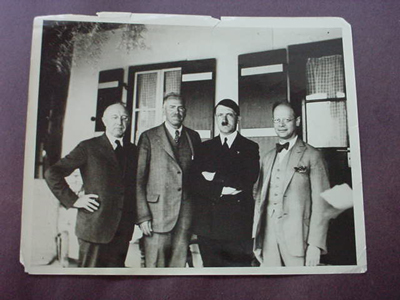 I would consider this to be a very rare photo and once more the buyer will most likely have an absolutely unique piece that might have been published in a 1930’s newspaper printed on newspaper stock but here is the original glossy press release. 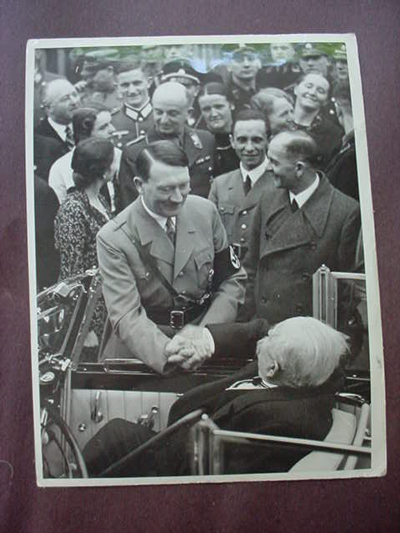 DESCRIPTION: This picture was released April 20, 1939, the 50th birthday of Adolf Hitler. 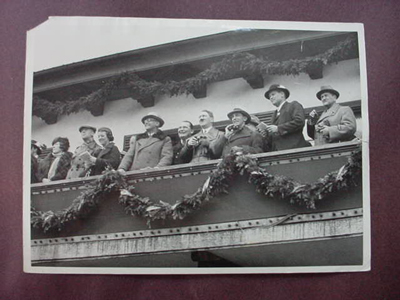 The largest birthday celebration that the world had yet seen and the longest parade occurred on this date in 1939 and this is an official press release that shows Hitler as he was seen just before the day’s festivities began; he stands behind the flag pole that bears his standard surrounded by German diplomatic officials and political leaders. It is a large picture measuring 7 ¼ x 9 ½ inches. 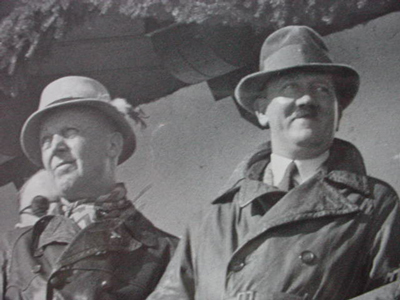 It is absolutely brilliant photography because it was taken by the photo crew of Heinrich Hoffmann who was Hitler’s official photographer and the only man allowed to photograph him so candidly and closely. 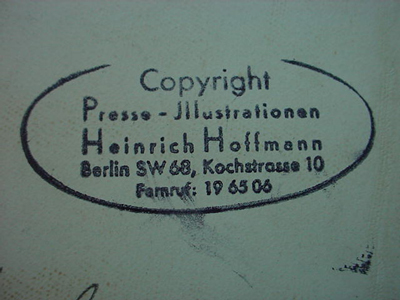 On the back of the picture is the copyright stamp from the Hoffmann Studios in Berlin. 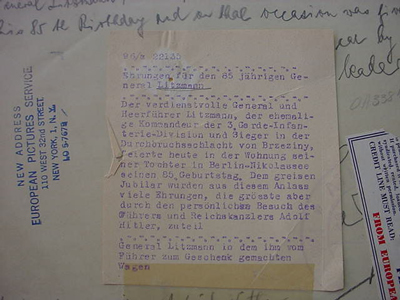 There is also a typed sentence in German that roughly translates to the Fuhrer awaits the great birthday parade of 20/4/1939. 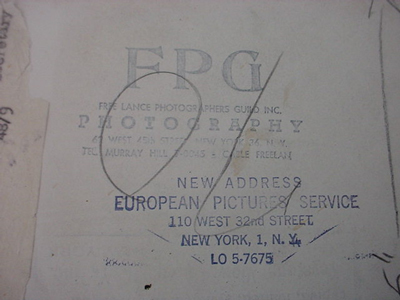 Under it is the sticker with caveat from the European picture service in New York that explains their terms for the use of the picture. 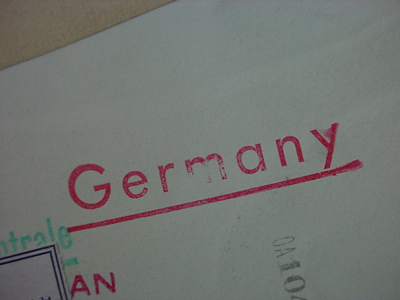 You can see also a German stamp that says Made in Germany and the Heinrich Hoffmann stamp. 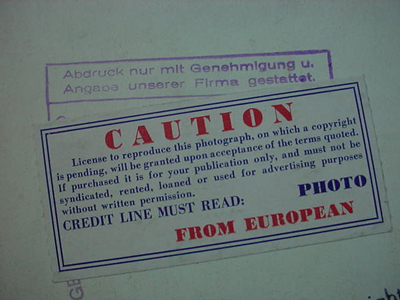 The German photograph service also had a stamp that is partially covered by the European Photo sticker that says basically copying is only with permission to the extent that our company permits. There is also a penciled notation that says file Hacha. This was possibly the reporter who received it before publication. 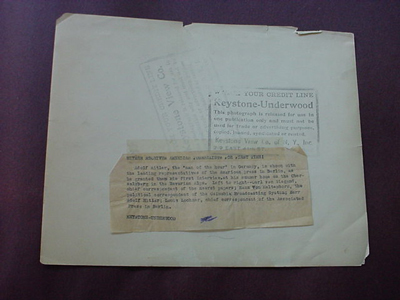 This is an original press release, possibly or probably unique, and may have been published in a newspaper in the 30’s but this is the original and very rare. 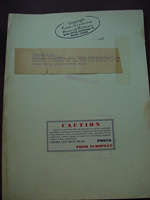 DESCRIPTION: Here is an exceptional original press release from the 1936 Olympic Games. 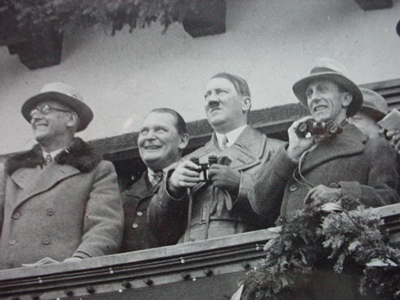 It is a classic release unique for sure showing Adolf Hitler and State Secretary Lammers (the one wearing glasses), Reich Minister Dr. Frick Minister President Hermann Goring, (Der Fuhrer) Reichspropaganda Minister Dr. Goebbels, president of the Olympic committee, Dr. Ritter Von Halt and Reichstatthalter Ritter von Epp. The first gentleman with the ladies is unidentified. The event they are watching is the 500 yard dash and 100 yard jump. 150,000 were in attendance in the Olympic House and ski stadium. This is a large photo measuring 9 ¾ x 7 inches. 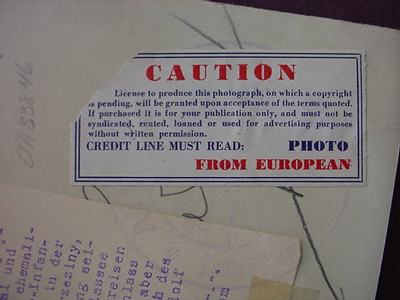 It has the obligatory ‘CAUTION’ tab attached by the European photo service out of New York with their CAVEAT that they are to be given credit for any use of the picture. Above this is a large explanation of what is going on in German and there are several penciled notes made by the publishing company agents. This is a 100% original press release and unique. It probably was used by some news syndicate and the picture was probably seen in a newspaper but in news type print and paper. This, however, is the glossy print (the original). 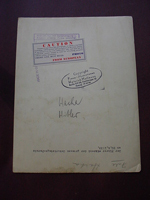 A great archival treasure recording a very important event of history and depicts Hitler in a rare moment of relaxation. DESCRIPTION: This was considered a Sonderdienst (Special Day) for the press picture central. 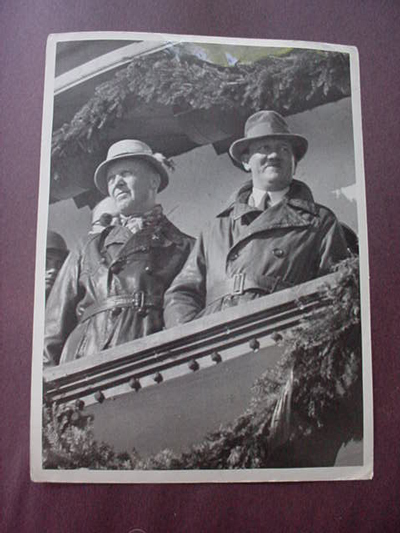 The tab on the back in German says the Joy of the Fuhrer is evident as he watches the leaping contest in combination 18km Lanlauf und sprunglauf. This picture was taken at the balcony of the ski stadium. 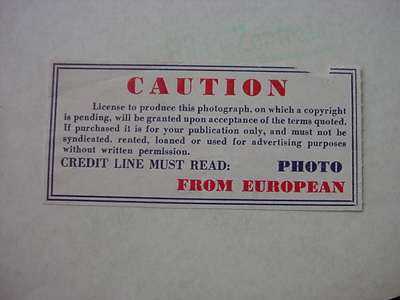 The back of the picture has the obligatory attached slip that has the caveat of the European Photo Service and their insistence on permission to be asked if the pictures is to be used; they were headquartered in New York City. This is a 100% original photograph press release and if you purchase it you will now own the official, original photographic study of the event.